Special Note: This week door lovers get to double-dip yet again. Head on over to the Daily Post’s Discover Challenge which is also featuring doors. Follow the instructions there to add your post to their list and be sure to check out the posts from lots of other door aficionados. 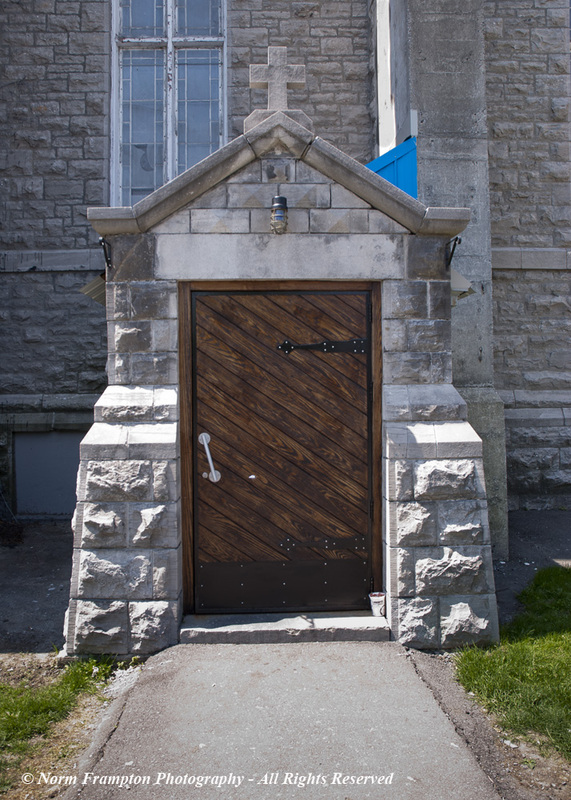 I found an odd mix of different doors on the historic St. Brigid’s Church during our visit to Ottawa last month. After searching online I couldn’t find any information as to why this wonderful old heritage status structure would be equipped with doors featuring such a variety of different styles and colors. 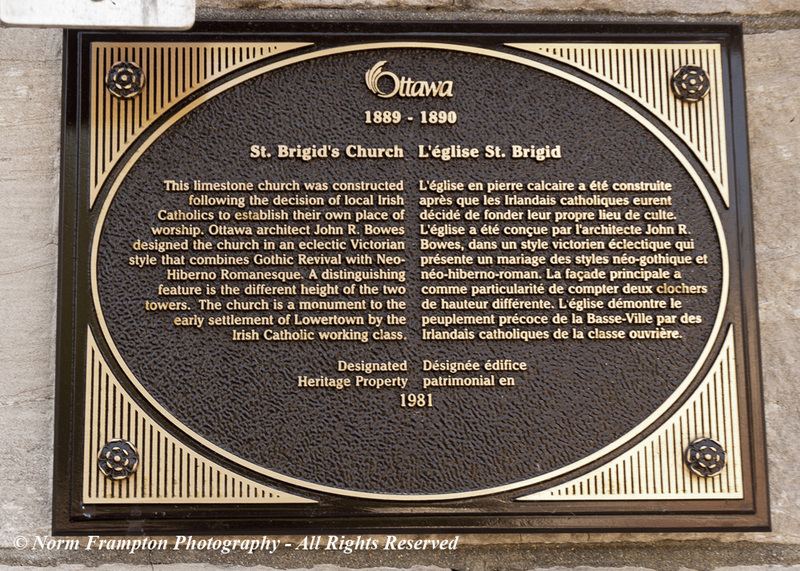 Gallery | This entry was posted in Photography, Thursday Doors, Travel and tagged Canada, Churches, Doors, Historic Architecture, History, Ottawa, St. Brigid's, Thursday Doors, Tourism, Walking Tours. Bookmark the permalink. Hi Norm, another lot of beautiful pictures, as usual. 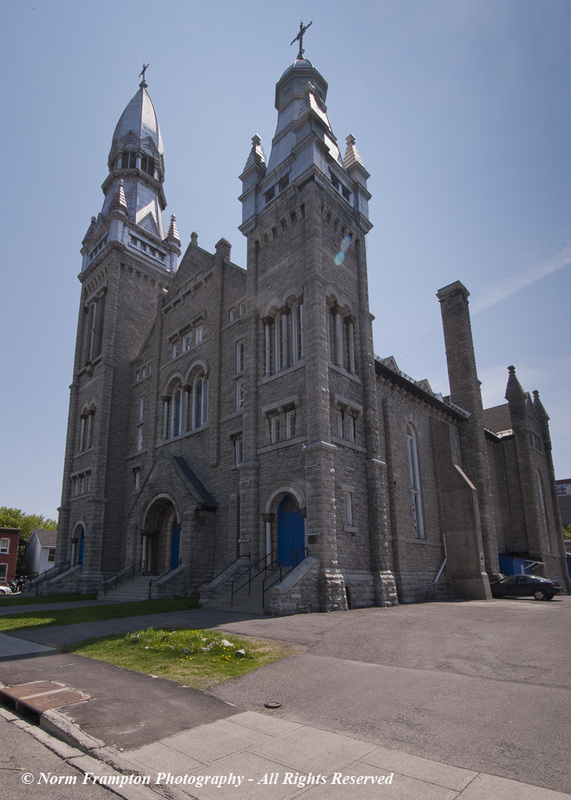 Great find; Did a quick google and it appears the church was decommissioned and sold and it is now an arts center; perhaps explains why they have multi-colored doors. Hi Norm – felt like I walked around this church myself – exploring a bit! 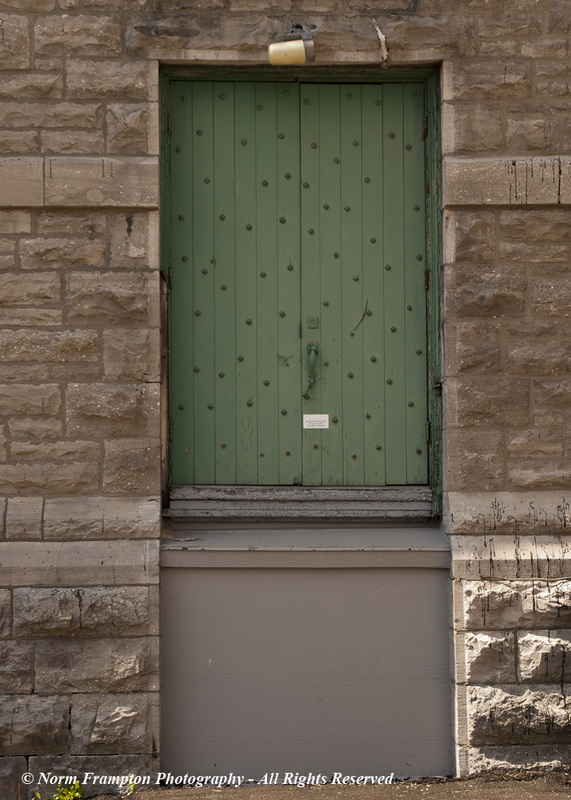 Oh and I wonder if it helps to have visitors come to colored doors – like “make the trick delivery at the green door….” And “bring your money thru the blue doors” – kidding! Well Mr Norm – I wholeheartedly agree – it must go thru the green! Hah! You are so fun- have a good week! The structure is massive! I want to go in and see the inside now. Thanks Deborah. It is a strange eclectic mix isn’t it? Blue is my favorite color, but looking at the rest of the building, I think that another color wuld have been moreftting. Love the arch of the front door! And. Wonder why the green door does not reach to the ground? Beautiful building, Norm! Oh, I didn’t think of that possibility! Love the stonework archway on that last picture, I always think it is very impressive how they build those! Thanks for the heads up about the Daily Prompt. I had already posted my doors with a story so it was easy to post it there as well. I like the green door the best on your post. I had to double check that all these doors were in fact on the same building. Quite something! What fun, all those different styles and colours on one building… makes you wonder why…. Green studs do it for me! The blue doors must have some meaning (or perhaps they don’t…) Interesting to speculate though. This week I finally got out to find some doors. I’m not sure about the blue doors Jan but it’s not the first time I’ve seen this around here. Thanks Joey. I have noticed that we seem to have a fair number of blue church doors. I have no idea why though…. Beautiful church — and such interesting doors! “You are most welcome. Thanks for hosting.” she said. I like those blue doors. The second installment of doors from Paris can be found over at my site Norm. I hope you enjoy them! I love the green door with rivets, and the cockamamie angled slats with the cockamamie handle set all cockamamie on it. I’m guessing the handle’s placement has to do with the underlying structure of the door. Obviously, the doors and towers were designed by committee. But they’re beautiful and interesting, anyway! Very much an eclectic oddball mix. Not sure why they’re different, but it makes life, and the challenge this week, all the more interesting. I like them all, but that blue really catches the eyes. The green and blue doors are my favorites. I like the back and side doors as well. I wonder about the side door. The slats seem to be angled the wrong way, unless they are a decorative overlay. The way they are set, gravity would pull them away from the hinges. I’m also curious about the green door. I’m wondering if the rivets are decorative or what the underlying structure looks like. I feel like I’m about to be like the Grinch “And he puzzled and puzzled ’till his puzzler was sore” – Before that happens, I’m off to catch a few early doors. Thanks Dan. The whole place seems to be a weird mix of mismatched elements, yet somehow when you look at the whole, it kinda works. Great find , Norm ! Interesting variety of doors. 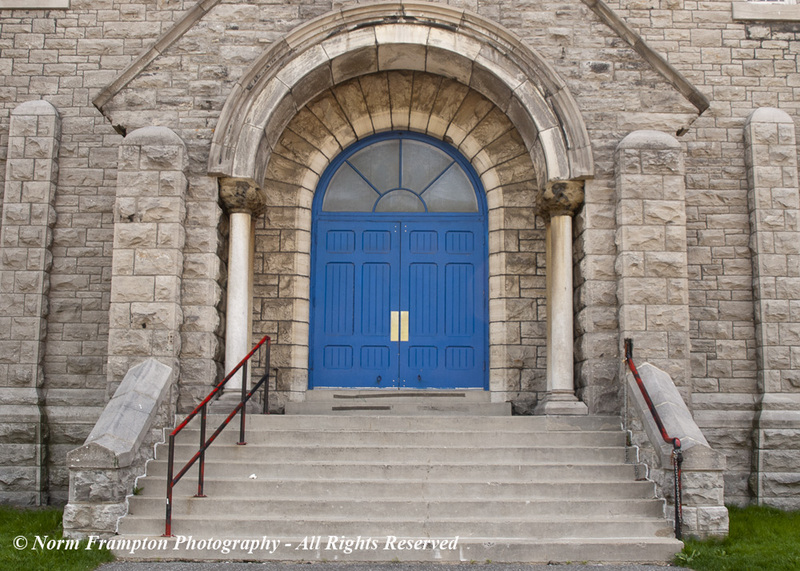 Wow a blue door on a church? I haven’t seen that before. It sure is grand building! 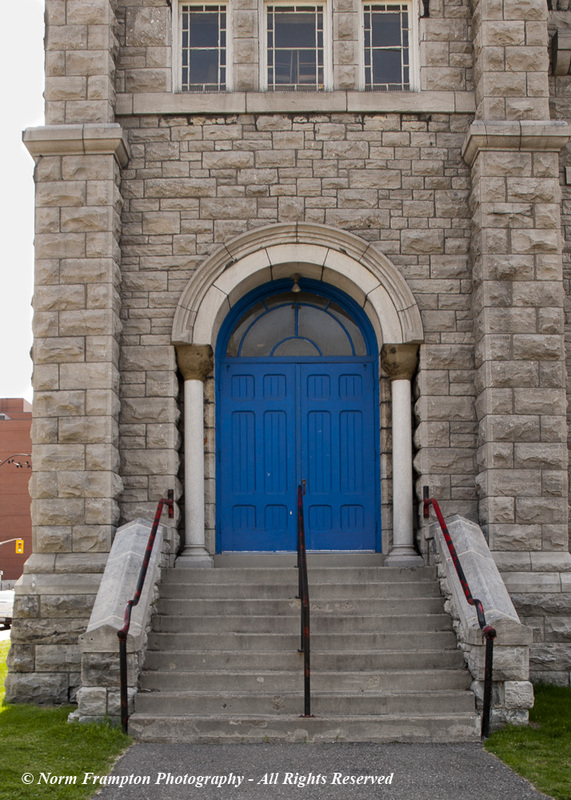 I don’t know why but blue doors on churches seem to be a little more common around here. I’ve seen a number of them over the past year or so. 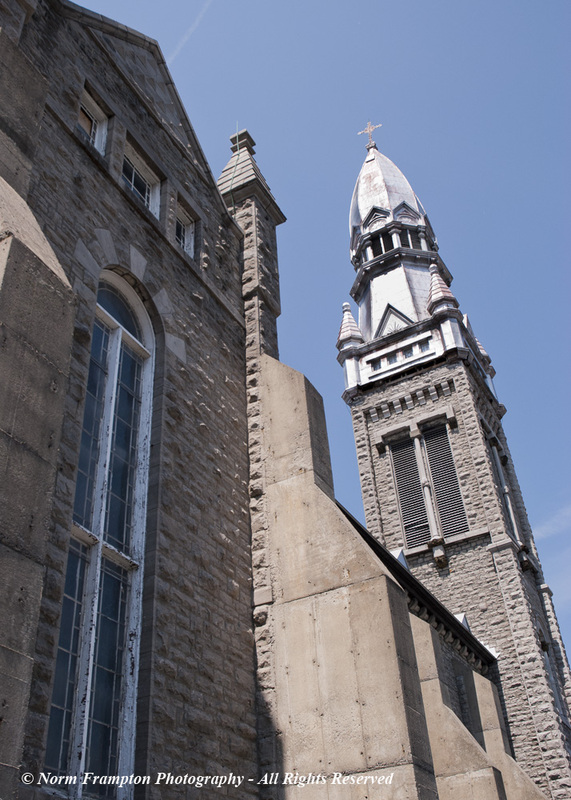 The angle of the first photo really makes this old church look formidable … even with its collection of different doors. An old door with metal rivets? how can that not be special?